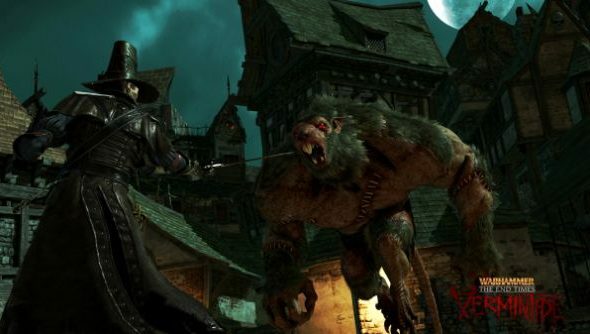 A brief new trailer for Warhammer: End Times – Vermintide hit E3 today showing off an awful lot of Skaven rat people getting their various parts cut off with very sharp implements. If this sounds like your kind of pest control, you’re going to want to hit play on that video. Set in Ubersreik during the End Times, Skaven armies have taken over the city and you and three friends have been called in to act as some kind of brutal extermination crew. It works all a bit like Left 4 Dead, but the zombies have bigger teeth, beadier eyes, and tails. The combat looks wonderfully bloody, with Skaven being chopped in two and beheaded all over the place. It’s all melee in the trailer, but developer Fatshark have told TrueAchievements that guns will certainly be part of the game. “We have a wide selection of ranged weapons that players can utilise to become effective at all distances. Each character has access to a wide range of firearms, stretching from bows and crossbows to pistols and repeating handguns,” they explained in a Q&A. Warhammer: End Times – Vermintide releases this autumn.